Cleaning the house is one thing, but cleaning the office is quite another. No matter what products you use, or how much time you seem to schedule yourself to do it, no one truly wants to clean the office themselves. 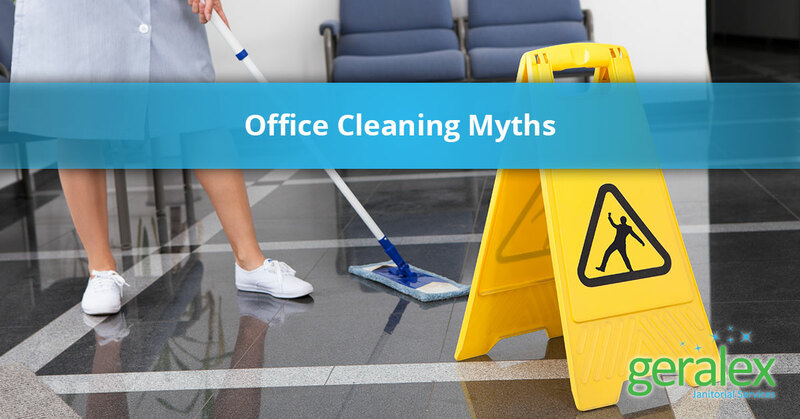 But knowing who to hire to help you clean can be tricky, especially when you start to believe some of the industry’s biggest myths. Wrong. Very wrong. While we tip our hats to the thought, there is no way that one person can handle cleaning the office all on their own while trying to manage the other countless tasks at hand. But that’s what your employees are for right? Guess again. After being in business for many years we have come to understand that many business owners do not use commercial cleaning services because they think that they can rely on their employees to help with the menial tasks. While it would be nice, and frankly, quite helpful, you cannot rely on your employees to take out their trash, clean out the fridge, wipe counter off, and sanitize the bathroom. Your employees want to do other things with their personal time, not help you clean their workspace. While you may be able to convince your team to take their trash out on Friday, chances are, that’s about as much as you’ll get out of them. The good news is, you can always count on us! Professional, friendly and always ready to help, we offer our office cleaning services any day, anytime, whenever you need us the most. Okay, so maybe office cleaning is not as important as remembering to pick your kids up at daycare, but it is up there on your list of things you need to do. As the first thing someone notices when they walk into your business, the cleanliness of your office represents the quality of the service that you provide. Neglecting to clean your office can impact a potential customer’s decision to work with you, as well as reduce the productivity of your employees. Good try. Just because you have spare cleaning products at home, does not mean you should bring them into the office and try to do a quick wipe down. Not only are you going to need much more than what you have on hand, but many cleaning products on the market are actually pretty harmful to you, your employees, your property, and the environment. Impacting the indoor air quality and potentially harming your workstation surfaces, hiring a professional office cleaning company is a sure way to guarantee you are left with a spotless, safe, and sanitary environment. If you’re looking for spotless, we got you. If you’re looking for easy, that’s us too. If what you want is a simple way to keep your office clean, your employees happy, and maintain your quality reputation, you guessed it – that’s what we do. Interested in finding out more? Get to know our team and find out why we are Chicago’s most trusted team of professionals providing years of experience and expertise. Cleaning your office around your schedule, we invite you to take a look at all of our commercial services and contact us today to schedule your first appointment.